When we went on the Parade of Homes tour two years ago, we noticed that the builders had painted all the walls of the entire downstairs the same color. This gave the illusion of making the house appear larger. We also noticed that they were using a darker neutral in tan/khaki or grays. This made the white of the mouldings, both crown and base really pop out. Overall, it was a fresh, clean look that fooled the buyer into thinking the home was bigger as all the rooms flowed easily into the other. We plan on putting this house on the market in 12-18 months so all my design decisions have to take this into account: how will our 15 year old house compare to what people can buy new? or buy within the price range that this house is being sold for? With that in mind the entire downstairs, except bathroom and laundry rooms are being painted with Valspar’s allen + roth Rock ar720. It’s a gray putty with a hint of brown. We tried a lot of samples on the wall and this one really impressed us. We painted the walls of the hall down to the laundry room and bathroom, which is the darkest hall in the house, and the color wasn’t so dark that it made you feel you were walking into a cave. OTOH, it’s not so light that it looks like a dirty cream. TIP! When trying a paint color put a sample on the wall – several walls – so you can see how light can strike it during different times of daylight. For example, we put a sample in the hallway with no windows, the front entry with some windows, and the dining which gets a lot of light. When our current house was built we were given the cheapest molding possible. This is one of the many ways a builder cuts costs and the small base molding has bugged me since Day One. In our plans to redo the first floor, replacing this molding with something larger figures high on the list. In the Parade of Homes we visited, we noticed that homes in the price range that we would be currently building our home today (due to skyrocketing building costs) and those priced above all came with larger molding! 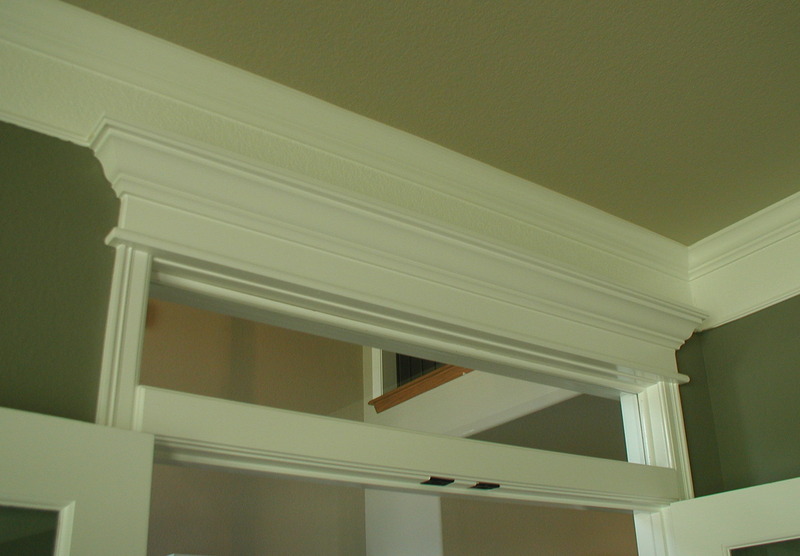 In this molding the ends are aligned with door molding (left) and a block (right). 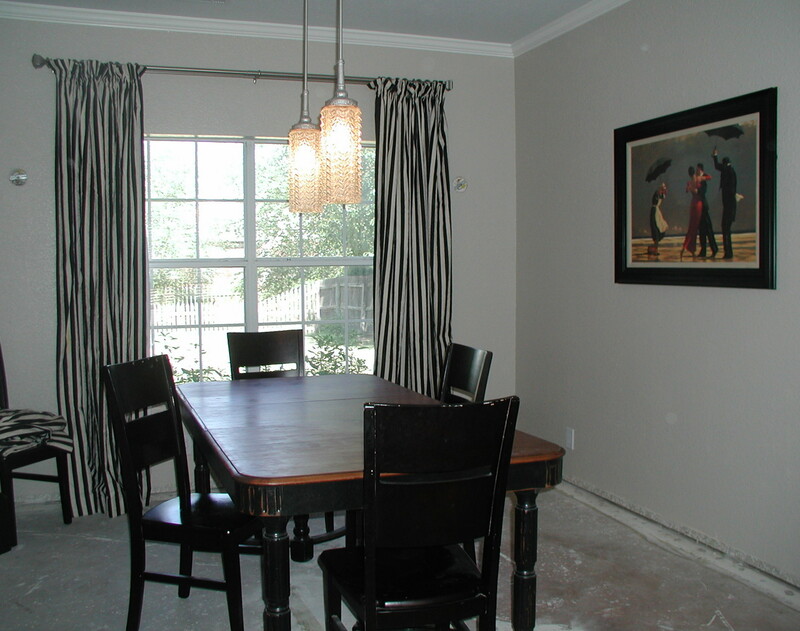 The white molding shows high contrast against the darker wood floors (all the rage) and the medium toned neutral paint. This would become a theme in all the Builder homes we saw on the tour. This photo caught some of the doorway molding that we also saw — at the right, you can see the open walk-through has molding on the inside of the pass. We saw this in about half of the homes we viewed and I am of two minds about it. I liked the look in squared off throughway’s and did not like it in arched throughway’s. 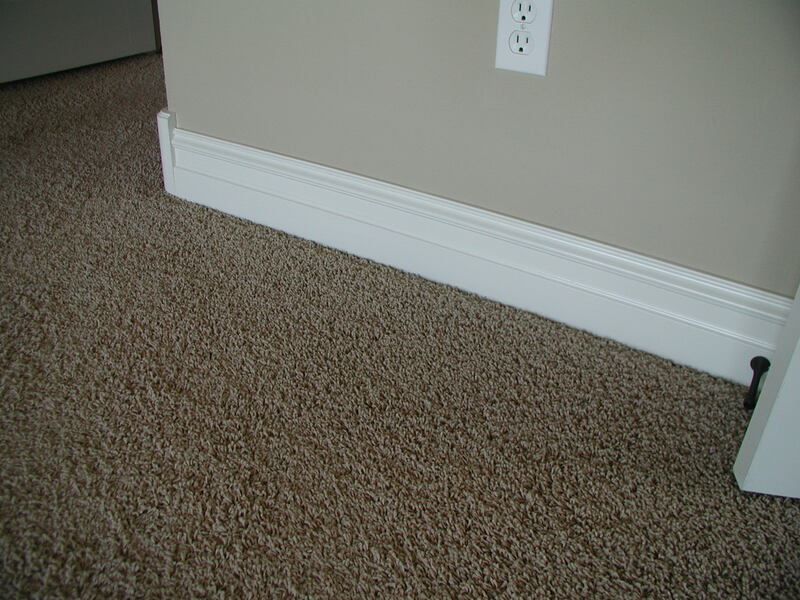 In all of these examples you can see that the base molding was quite substantial in size. 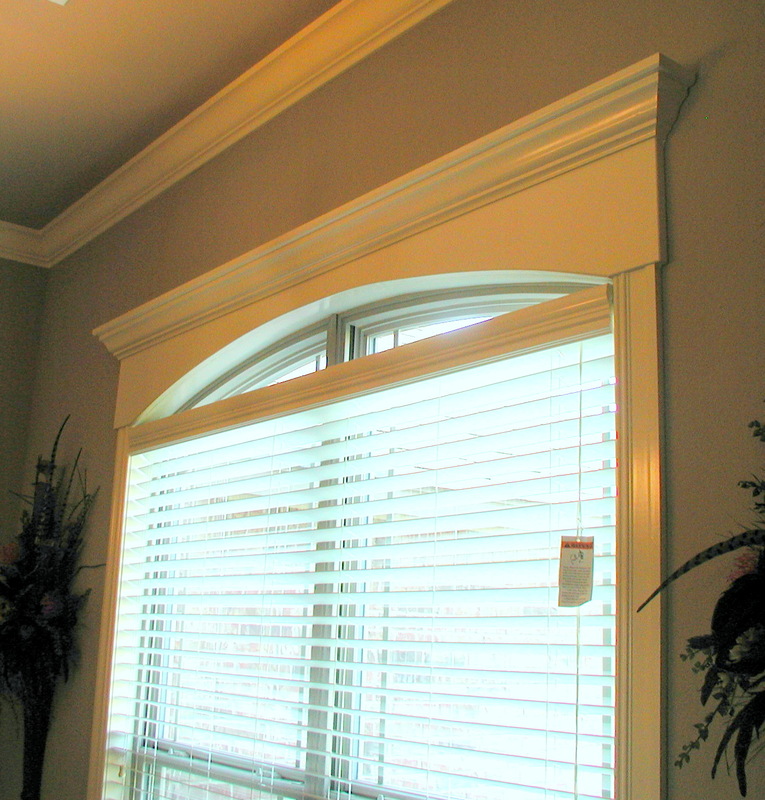 Widths were probably about 6″ as compared to our current base molding which is about 3″. Profiles were kept simple and because of the spare furniture put in builder’s homes, was quite noticeable. From this next photo, and all the others, you can see that no quarter round was added – something that was placed in our home and which I have hated for years as being just another something to collect dirt and dust when trying to clean floors. Like all molding, the wider it is, the more expensive. The more ornate the profile, the more expensive. 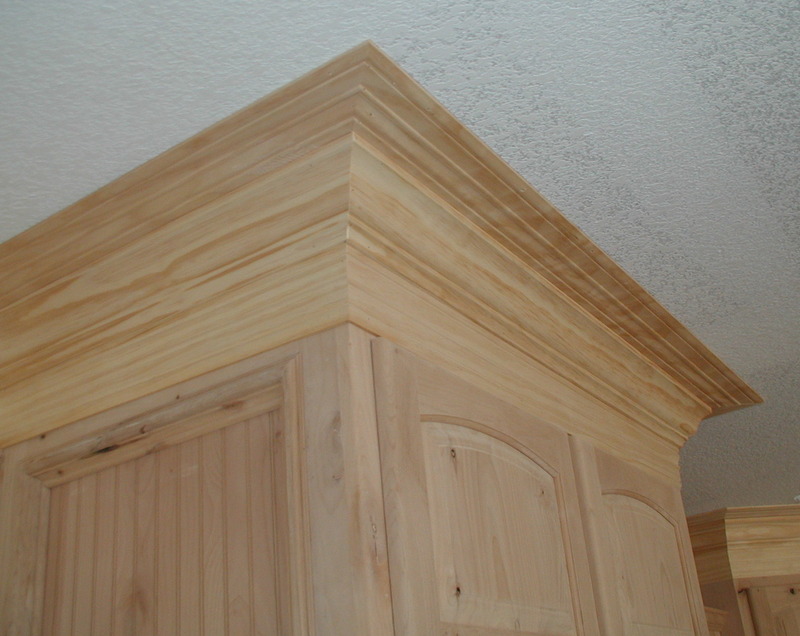 Molding that is meant to be stained has few if any join marks which makes it more expensive as compared to pine or MDF with more joints and is meant to be painted. 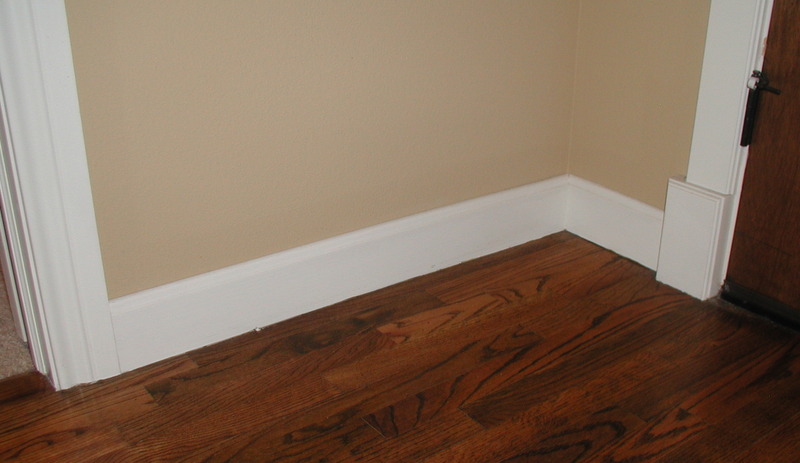 We did notice in one home that a very simple 3″ base was added to on the top with a more ornate profile base and since they were next to each other and painted over with the same color, appeared to be one larger piece. I am not sure this would actually save you money. However if you had a base molding you did not want to replace but wanted the bigger look you could add another piece of base and double the size appearance. During our trip through many of the homes featured on the Parade of Homes, we saw a new way of dealing with doors and windows that really seduced us. This was additional trim and molding at the top of the door and windows, as well as the bottom of the door and windows. None of this molding is out of reach of the simple carpenter or even the most basic budget. The reality is that additions of these types ups the rich Old World feeling of home. Because it is projects that typically increase the cost of building due to time and materials, it also sends a vibe to the visitor that this home is older and richer then perhaps it’s neighbor without the moldings. Window moldings were being seen throughout the home – the fancier and larger treatments with the common rooms of breakfast, dining, great room, living room and master, but also even in the spare bedrooms and game rooms. Perhaps moldings have grown in popularity as fewer people are using full window curtains to dress a window and more are opting for blinds with perhaps a frisson of drape? 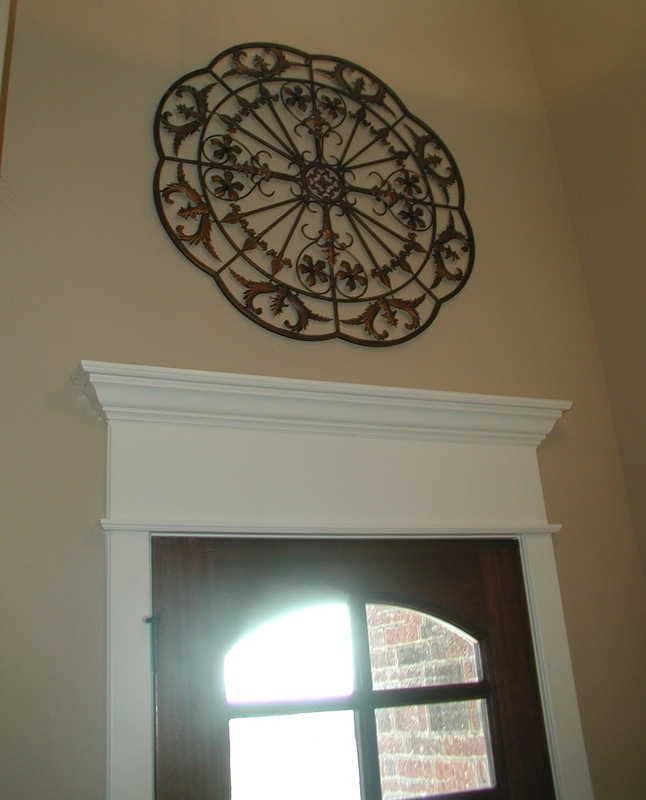 See the DIY, step by step tutorial on this type of over door, moulding project! We’ve been spending the week doing some of our local Parade of Homes. These are open homes by builders you can visit for free and our purpose was to go and take note of some of the trends and buyer-desired features so we could later duplicate them in our house! 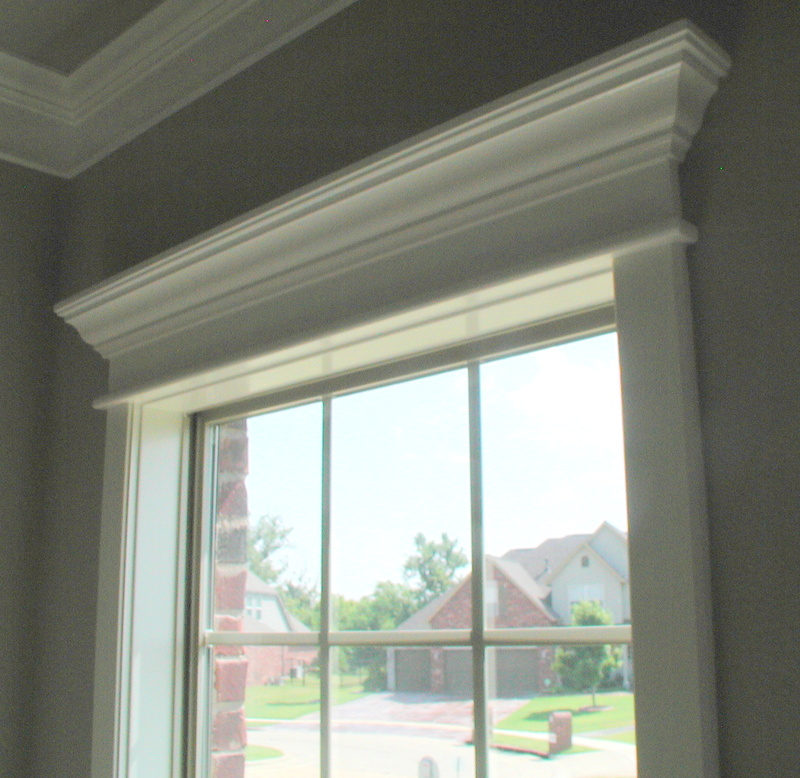 A very noticeable feature was the use of molding, both base and crown, on walls, ceilings and over doors and windows. 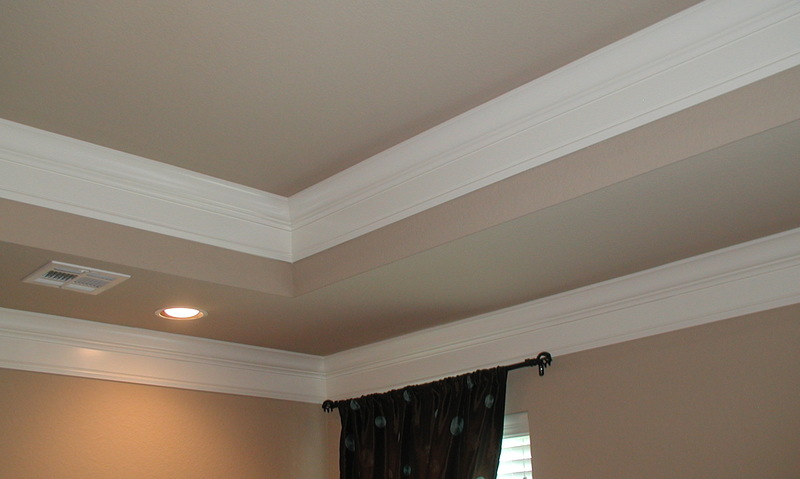 Let’s examine crown molding first as I love it. The most common rooms with crown molding is the formal dining, great room and master. Often we also saw it in the kitchen and entry way. We saw none in the upstairs areas or the extra bedrooms. The reality is that it is time consuming and expensive to install. 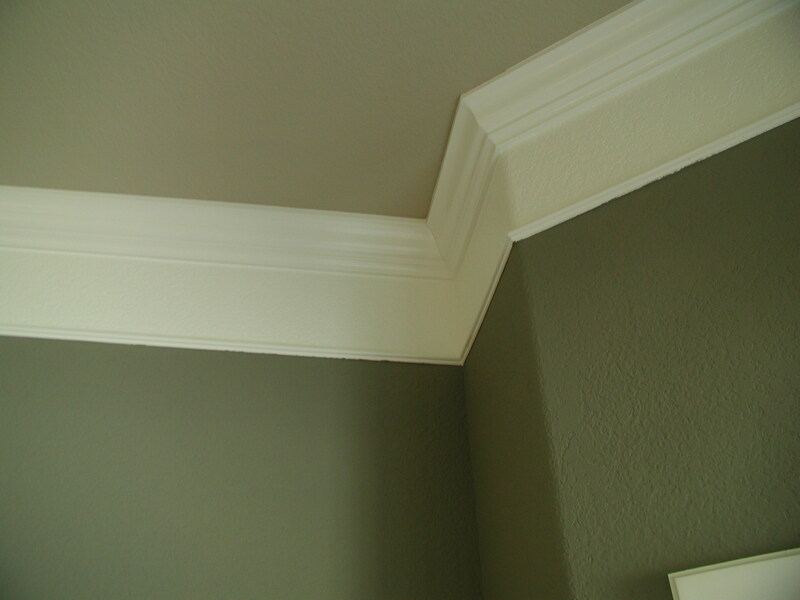 Crown molding is sold by the linear foot. It can be bought in oak, pine and even MDF and if it wood is designed to be stained will be more expensive, then the type that has more joints and is made to painted. Most of the crown molding and other molding we saw was painted white on medium tone neutral walls. In a few of the homes it was stained a deep, rich brown. We even saw one example that was painted cream and then was glazed over so the lines of the molding were even more evident (just personal taste but we both didn’t like it – too trendy and it already looked dated). 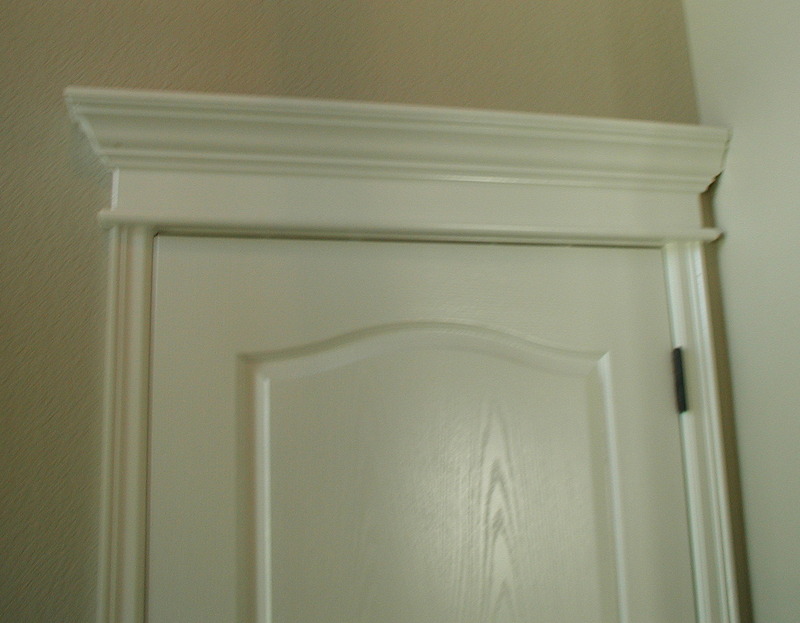 Some of the homes cheated by using this decorative joining piece (photo left) so they wouldn’t have to cut it all fancy. 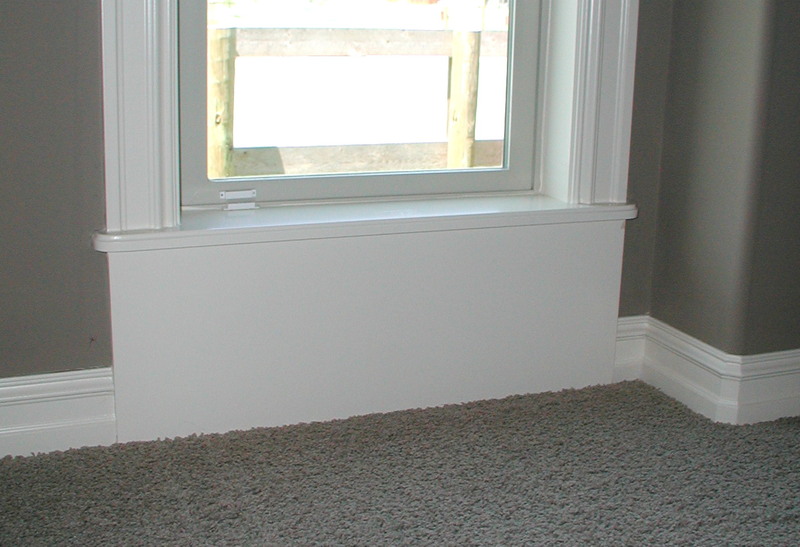 Having installed crown molding ourselves, this probably saved tons of time! Here are some clever ways the builders cheated to gain the look without the price. To see the full effects of the crown and for better details, click the photos. That will show it enlarged and details can be better viewed. 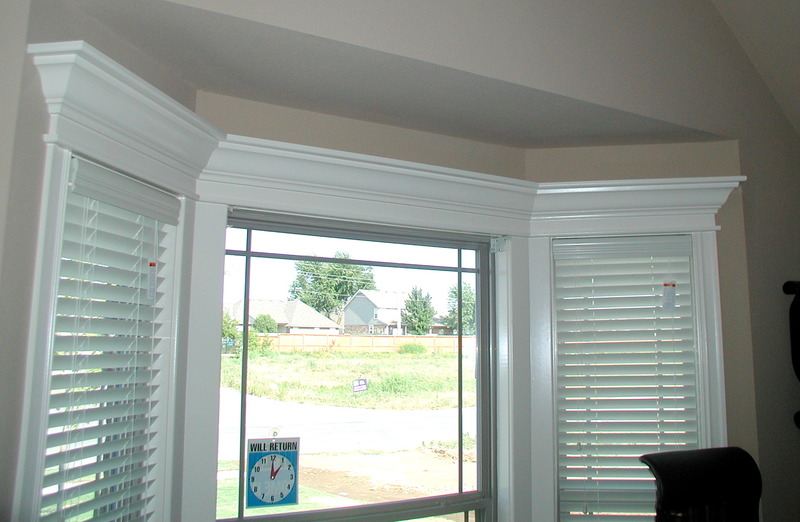 In this example, the builder has put in crown molding, then left a section of plaster painted white below it. A small bead of molding defines the bottom of the white area, giving the illusion that all the white area is molding (it is not). This was a very old trick used as long ago as the Victorian age. 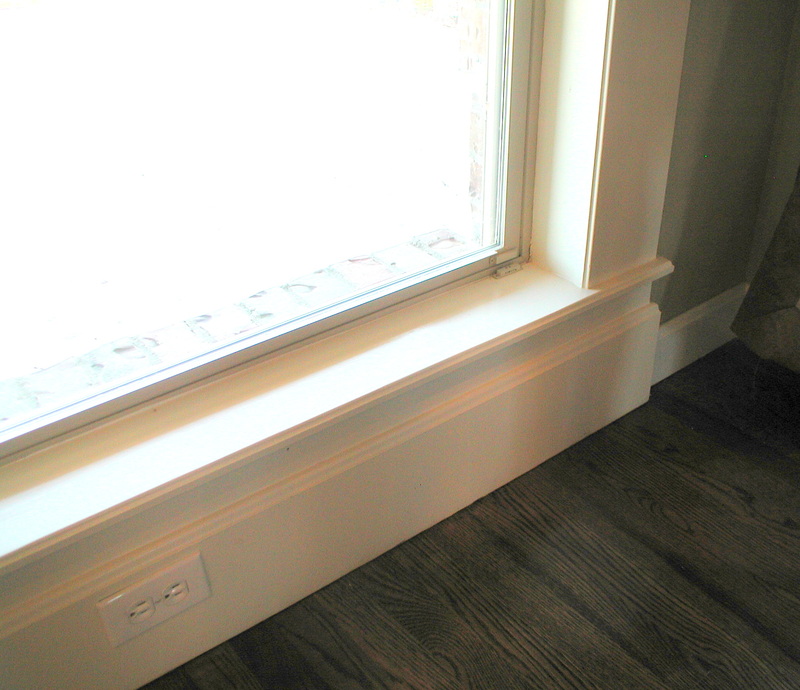 In this yet to be painted crown molding design, above and below the crown molding is placed a simple piece of baseboard. This gives the optical appearance that the entire unit is one massive piece of crown molding (it’s not). If you have very high ceilings and want to make a massive statement, this fits the bill! 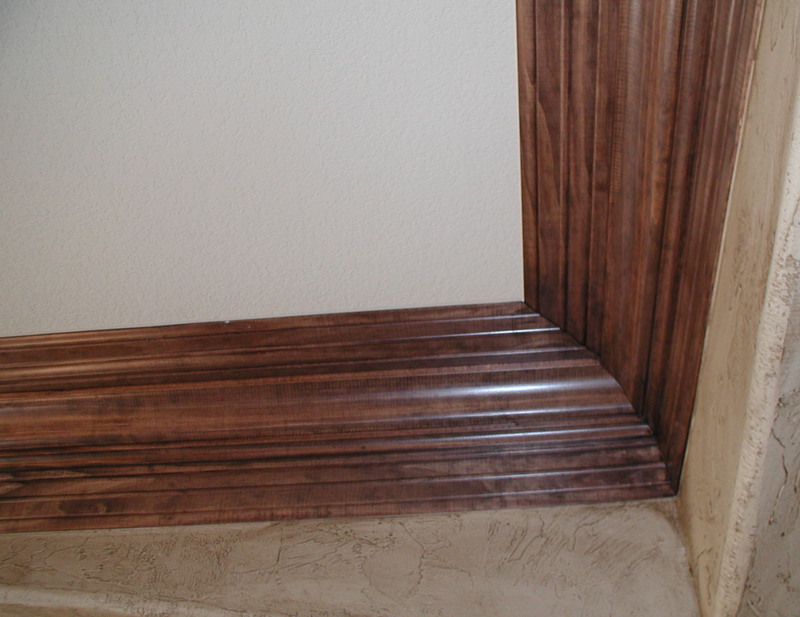 Here is the same technique of above and below base molding with crown but it is stained. Here you can see how the optical illusion of one massive (and supposedly high-dollar piece of crown molding graces the ceiling. In this version (below), which we liked best, the crown is offset with only one piece of baseboard that is located below (as opposed to the previous version which did above and below). From a visitors’ viewpoint, it was immediately noticeable if a home had crown molding or not because of the darker shade of neutral that is now popular with builders. The crisp white of the crown molding made the ceiling and wall paint really pop and gave the entire home a fresh, new feel. 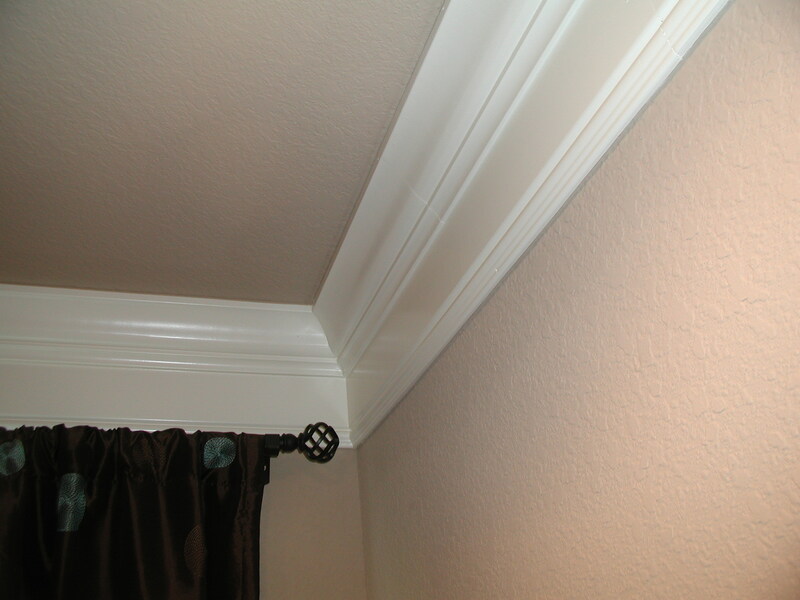 Crown molding is often noted in real estate seller’s notes on a home up for sale so it is an attractive feature that buyers desire. With a little ingenuity you can also have that ka-ching look with just a bit of sweat equity!